We absolutely love well behaved dogs! We love having them and their responsible owners visit and stay with us on the farm. Remember that our campsite will be full of families with small children, other dogs and surrounded by live stock. Therefore, please keep your dogs under control, keep a good eye on them and make sure that you know where they are at all times. Your dog is your responsibility and if our dog policy is not adhered to, then we reserve the right to ask the owner to leave or to remove their dog from the farm. Are there designated areas for my dog? There are no designated areas on the farm but please be respectful of other family’s space and appreciate that they may not want other people’s dogs coming on to their pitch. Should my dog be kept on a lead? Dogs must be kept on a lead at all times when walking through the chicken fields. 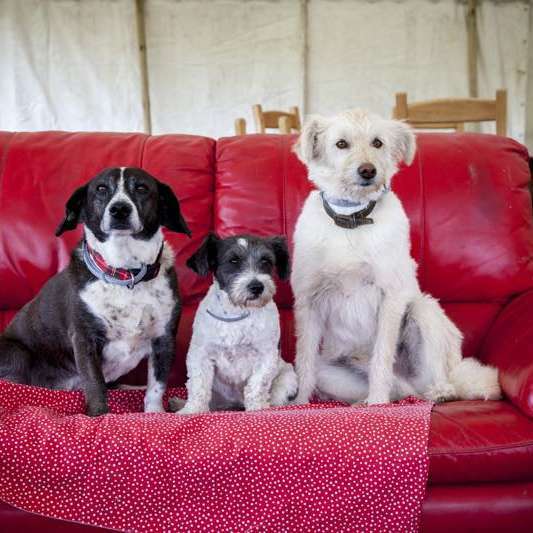 In the campsite and other areas of the farm, if your dog cannot be kept under close control by yourself, then we advise that you put your dog on a lead. We reserve the right to ask any owner to put and keep their dog on a lead if we feel it is necessary. Are there dog mess bins on site? We do not provide bins for dog mess. To keep our farm looking lovely and to make it pleasant for other people who visit, please clear up after your dog and take all rubbish home with you. If you have a noisy dog that barks or whines a lot, please consider leaving it at home. We will have to respond to complaints of excess noise and in a worst-case scenario, you may be asked to remove your dog from the campsite. Dogs must not be left unattended in any vehicle of any description at any time. Failure to observe this polite request will result in the relevant authority being informed and you will be asked to leave the campsite. Any dog showing signs of aggression that is not under your close control will result in the owner being asked to remove it from the campsite and farm immediately – without exception.